DB Solo allows DBAs and advanced developers to create and delete common database objects without knowing the precise SQL syntax. Below is a collection of screen shots depicting some of the management features available in DB Solo for creating tablespaces, rules, defaults and other objects. To see all these and other exciting features, download your evaluation copy of DB Solo today. Since DB Solo is a true cross-platform tool, all these DBA features are available on all supported OS platforms Mac OS X, RedHat Linux, Solaris (Sparc) and Windows (XP, 2000, NT). Tablespace Name. User-defined unique name for the tablespace. Type. Type of the tablespace; Permanent, Temporary or Undo. Status. Initial status of the tablespace, either online or offline. Logging. Are DML operations in this tablespace logged or not. Extent Management. You can use uniform extent size in the tablespace or let Oracle automatically determine the optimal size of the extents in the tablespace. Segment Space Management. Segments can have either automatic or manual size allocation. 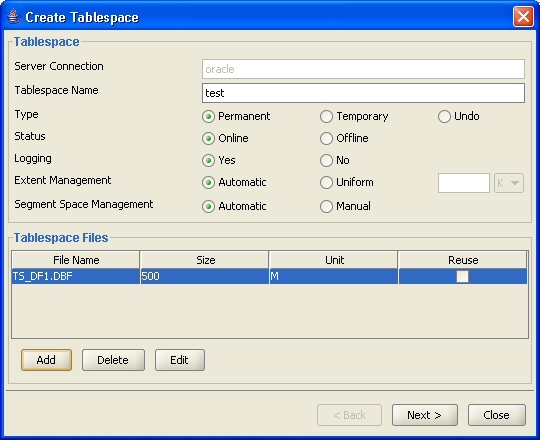 The tablespace files section allows you to define the files that contain the actual data in the tablespace. You must define at least one file before you can proceed to the next page. File Name. OS-dependent name of the data file. This can also be the full path of the file including the directory. Size & Unit. Size of the file, unit can be either K (kilobytes) or M (megabytes). Reuse. If the file already exist, check the reuse checkbox to use the existing file. You can click on the edit button to specify additional size attributes for the selected file, such as AUTOEXTEND on/off, INCREMENT and MAXSIZE. Create Default [Sybase, MS SQL Server]. 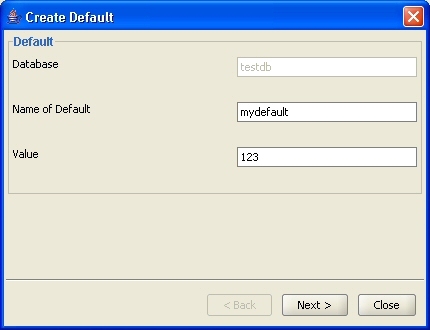 The create default dialog allows you to create default definitions for Sybase and Microsoft SQL Server. The default will be created in the database shown in the 'Database' field. Name. Identifier for the default. Text. Constant expression for the default. The constant expression must match the column data type when it is used. Binary data must start with 0x and money values should start with the dollar symbol $. 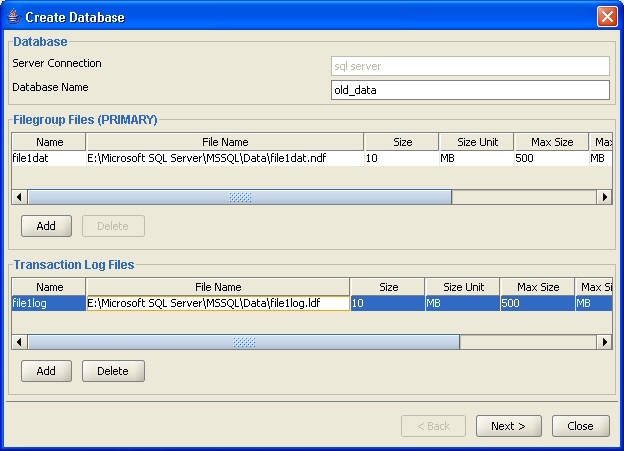 Create Filegroup [MS SQL Server]. 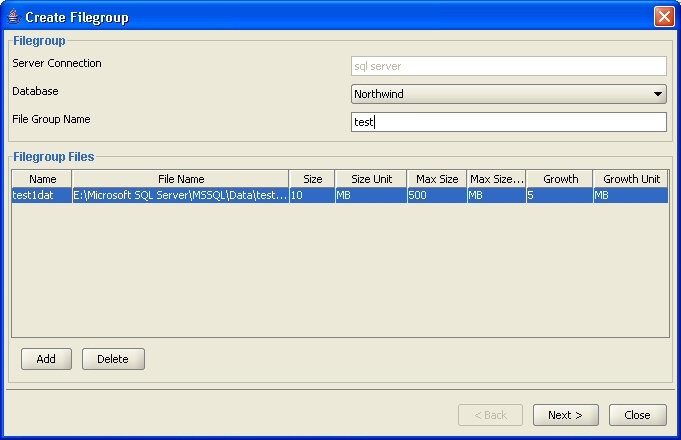 The Create Filegroup dialog allows you to create filegroups on SQL Server, providing you with an ALTER DATABASE ADD FILEGROUP and ALTER DATABASE ADD FILE commands corresponding to the values you specify. The new filegroup will be created in the database specified in the 'Database' combo box and its name is defined in the 'File Group Name' field. The 'Filegroup Files' section contains the physical filesystem files comprising the filegroup. You must specify the following values for each file you want to add to the group. Name. User-defined logical name for the file. File Name. Operating system file name for the file in question. Size & Size Unit. Size of the physical file. Unit can be either KB, MB, GB or TB for kilobytes, megabytes, gigabytes and terabytes, respectively. Max Size & Max Size Unit. Maximum size of the file it is allowed to grow to. Growth & Growth Unit. File size increment used when the file needs to grow. Create Index [All supported platforms]. 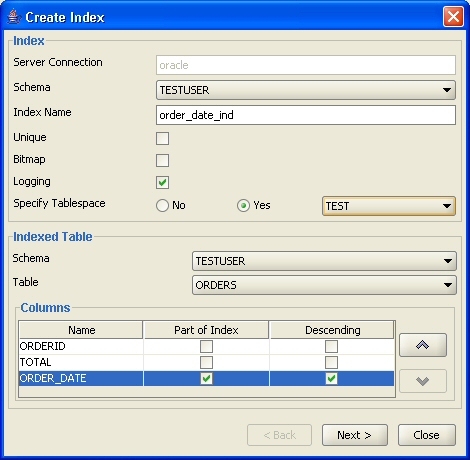 The create index dialog allows you to create an index for an existing table. On the second page of the wizard, you will be presented with a CREATE INDEX command corresponding to the values you specified. The dialog can be invoked from the Indexes tab of a table. Index creation is supported for all available database products; Oracle, Sybase, DB2, MySQL, Solid and Microsoft SQL Server. Bitmap. By selecting this option, a bitmap index will be created instead of the standard B-Tree index. Bitmap indexes are effective when used in columns with relatively small number of distinct values. Bitmap indexes are often used in data warehousing applications. Logging. If selected, specifies that index creation will be logged in the redo logs. After index creation, specifies whether SQL*Loader direct loads are logged in redo logs or not. Specify Tablespace. You can specify the tablespace in which the index will be created. To distribute physical I/O across multiple physical disks, use separate tablespaces for table and its indexes, make sure the data files of the tablespaces are on separate physical disks. Create Redo Log Group [Oracle]. 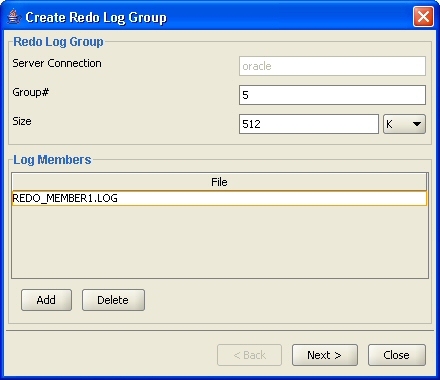 Create Redo Log Group dialog allows you to create additional redo groups on your Oracle database. It is recommended to have at least two members per group placed on two separate physical disks to add redundancy. In case one of the disks fails, Oracle can still write to one of the members and continue operating normally. 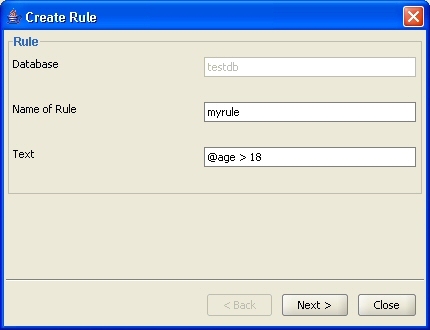 Create Rule [Sybase and MS SQL Server]. Name. Identifier for the rule. Text. Condition expression for the rule. The condition can contain arguments that are prefixed with the @ symbol. Typically rules can contain expressions that are valid in where statements. Create Database [SQL Server, Sybase, MySQL, Solid]. Database Name. User-defined name for the database. Filegroup Files. This section allows you to define one or more physical OS files that comprise the new database. You must enter values for the initial size (SIZE), maximum size (MAXSIZE) and growth (FILEGROWTH) for each data file you add. For each of the aforementioned attribute you must specify a numeric value and the unit of the value (KB, MB, GB or TB). Transaction Log Files. This section allows you to specify one or more physical OS files that will contain the transaction log of the new database. Notice that the dialog will look different and contain different attributes depending on the selected DBMS vendor. Create Sequence [Oracle, PostgreSQL and DB2]. Sequences are database objects used for creating sequential numbers that are typically used to create values for primary key columns. 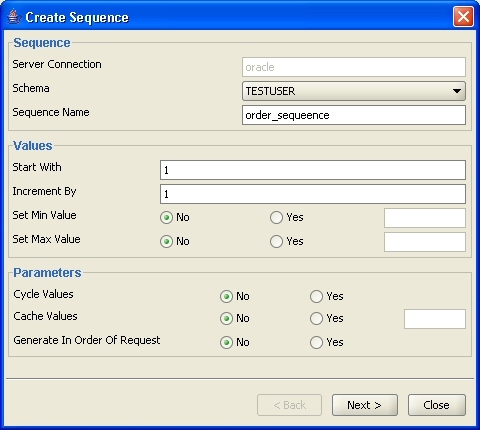 The Create Sequence dialog allows you to create sequences on Oracle without knowing the exact SQL syntax. Add Constraint [All supported platforms]. 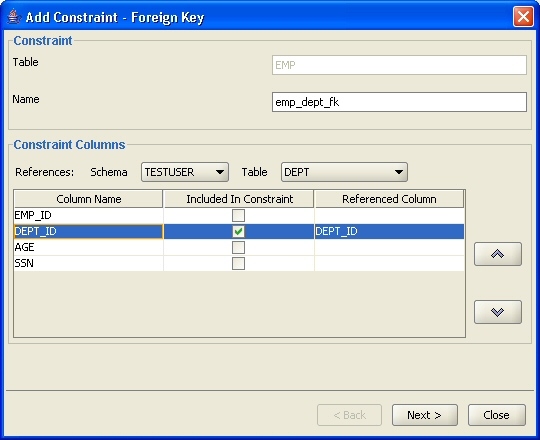 Add Constraint dialog allows you to add PRIMARY KEY, FOREIGN KEY and UNIQUE constraints to your existing tables. You do not need to know the precise SQL syntax for the ALTER TABLE ADD CONSTRAINT command, just pick the constraint type and the columns that are part of the constraint. In the case of a foreign key, you also have to pick the primary table and its columns. You can review the SQL statement before it is sent to the server in case you wish to modify it manually.